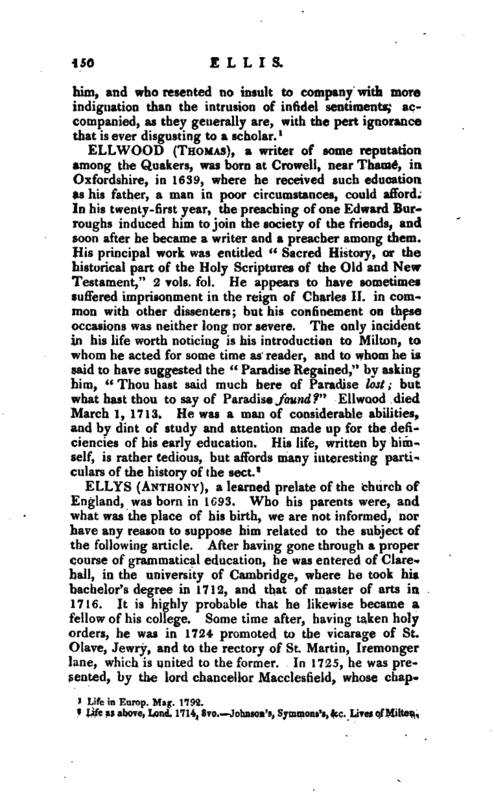 , a learned prelate of the church of England, was born in 1693. Who his parents were, and what was the place of his birth, we are not informed, nor have any reason to suppose him related to the subject of the following article. After having gone through a proper course of grammatical education, he was entered of Clarehall, in the university of Cambridge, where he took his bachelor’s degree in 1712, and that of master of arts in 1716. It is highly probable that he likewise became a fellow of his college. Some time after, having taken holy orders, ne was in 1724 promoted to the vicarage of St. Olave, Jewry, and to the rectory of St. Martin, Iremonger lane, which is united to the former. In 1725, he was presented, by the lord chancellor Macclesfield, whose | chaplain he is said to have been, to a prebendal stall in the cathedral church of Gloucester. On the 25th of April, 1728, when king George the Second paid a visit to the university of Cambridge, Mr. Ellys was created doctor of divinity, being one of those who were named in the chancellor’s list upon that occasion. 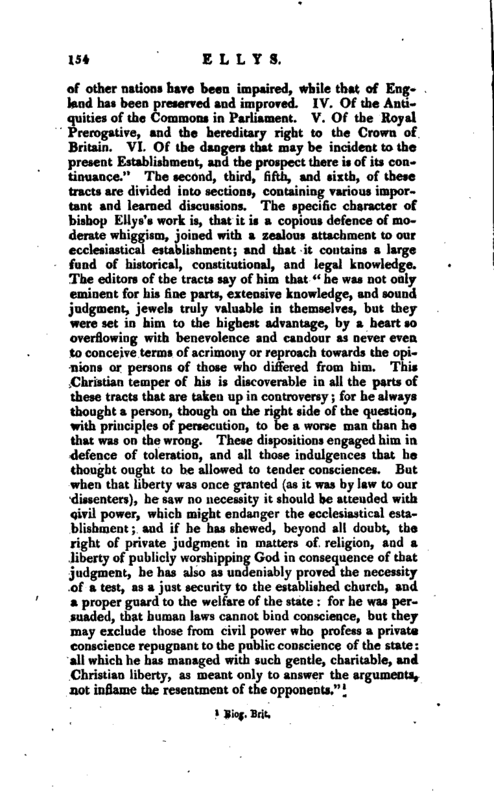 In 1736, when the protestant dissenters were engaged in endeavouring to obtain a repeal of the corporation and test acts, Dr. Ellys appeared in opposition to that measure, and published a work, entitled “A Plea for the Sacramental Test, as a just security to the Church established, and very conducive to the welfare of the State,” 4to, an elaborate performance, written with great ability and learning. 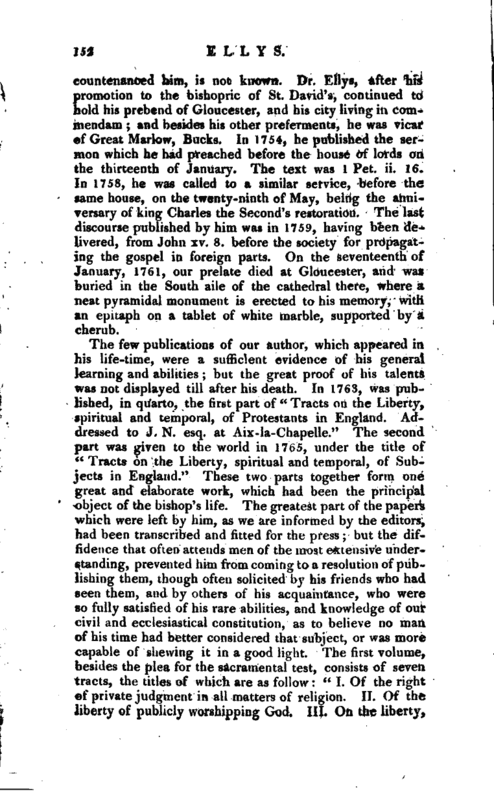 In 1749, Dr. Ellys published a sermon, which he preached before the house of commons on the thirtieth of January. This discourse, the text of which was Mat. xxii. 21, was printed, as then was customary, at the request of the house. Our author’s next publication was early in 1752, being “Remarks on an Essay concerning Miracles, published by David Hume, esq, among his Philosophical Essays,” 4to. 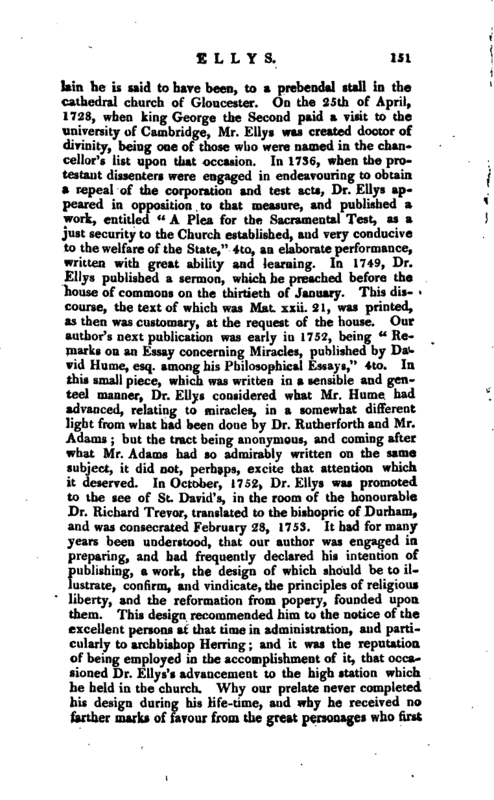 In this small piece, which was written in a sensible and genteel manner, Dr. Ellys considered what Mr. Hume had advanced, relating to miracles, in a somewhat different light from what had been done by Dr. Rutherforth and Mr. Adams; but the tract being anonympus, and coming after what Mr. Adams had so admirably written on the same subject, it did not, perhaps, excite that attention which, it deserved. In October, 1752, Dr. Ellys was promoted to the see of St. David’s, in the room of the honourable Dr. Richard Trevor, translated to the bishopric of Durham, and was consecrated February 28, 1753. It had for many years been understood, that our author was engaged in preparing, and had frequently declared his intention of publishing, a work, the design of which should be to illustrate, confirm, and vindicate, the principles of religious liberty, and the reformation from popery, founded upon them. This design recommended him to the notice of the excellent persons at that time in administration, and particularly to archbishop Herring; and it was the reputation of being employed in the accomplishment of it, that occasioned Dr. Ellys’s advancement to the high station which he held in the church. Why our prelate never completed his design during his life-time, and why he received no farther marks of favour, from the great personages who first | countenanced him, is not known. Dr. Ellys, after his promotion to the bishopric of St. )avid’s, continued to bold his prebend of Gloucester, and his city living in commendam; and besides his other preferments, he was vicar of Great Marlow, Bucks. In 1754, he published the sermon which he had preached before the house of lords on the thirteenth of January. The text was 1 Pet. ii. 16. In 1758, he was called to a similar service, before the tame house, on the twenty-ninth of May, being the anniversary of king Charles the Second’s restoration. The last discourse published by him was in 1759, having been delivered, from John xv. 8. before the society for propagating the gospel in foreign parts. On the seventeenth of January, 1761, our prelate died at Gloucester, and was buried in the South aile of the cathedral there, where a neat pyramidal monument is erected to his memory, with an epitaph on a tablet of white marble, supported by a cherub. The few publications of our author, which appeared in his life-time, were a sufficient evidence of his general learning and abilities; but the great proof of his talents was not displayed till after his death. In 1763, was published, in quarto, the first part of “Tracts on the Liberty, spiritual and temporal, of Protestants in England. Addressed to J. N. esq. at Aix-la-Chapelle.” The second part was given to the world in 1765, under the title of “Tracts on r the Liberty, spiritual and temporal, of Subjects in England.” These two parts together form one great and elaborate work, which had been the principal object of the bishop’s life. 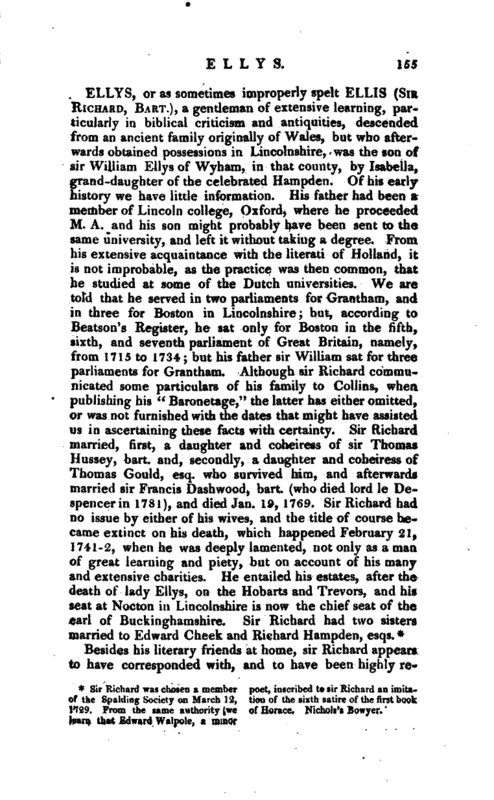 The greatest part of the papers which were left by him, as we are informed by the editors, had been transcribed and fitted for the press; but the diffidence that often attends men of the most extensive understanding, prevented him from coining to a resolution of publishing them, though often solicited by his friends who had seen them, and by others of his acquaintance, who were so fully satisfied of his rare abilities, and knowledge of our civil and ecclesiastical constitution, as to believe no man of his time had better considered that subject, or was more capable of shewing it in a good light. The first volume, besides the plea for the sacramental test, consists of seven -tracts, the titles of which are as follow: “I. Of the right of private judgment in all matters of religion. II. Of the liberty of publicly worshipping God, III. On the liberty, | as to matters ecclesiastical, when a religion is publicly established. IV. On the liberty recovered to the people of England, by suppressing the authority formerly exercised over this realm by the Bishop of Rome. V. An answer to the objections to the ill use which, it is alleged, has been made of the liberty we have gained, by having broken with the see of Rome. VI. The nature of Supremacy, in matters ecclesiastical, vested in the crown. VII. 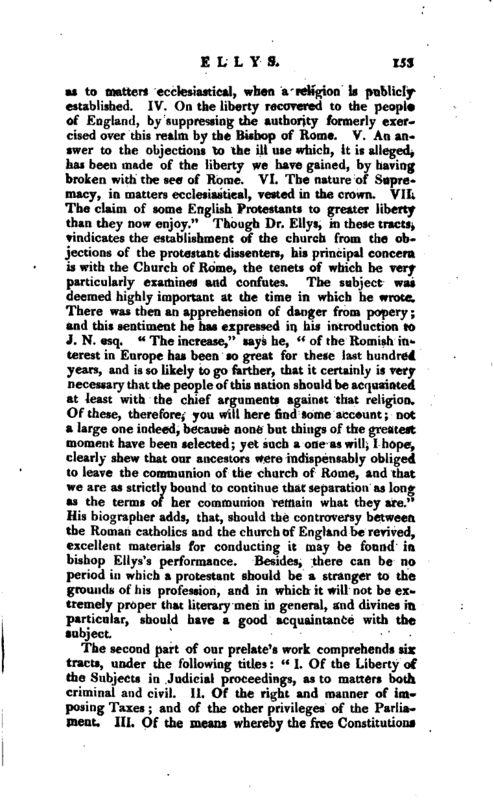 The claim of some English Protestants to greater liberty than they now enjoy.” Though Dr. Ellys, in these tracts, vindicates the establishment of the church from the objections of the protestant dissenters, his principal concern, is with the Church of Rome, the tenets of which he very particularly examines and confutes. The subject was deemed highly important at the time in which he wrote. There was then an apprehension of danger from popery; and this sentiment he has expressed in his introduction to J. N. esq. “The increase,” says he, “of the Romish interest in Europe has been so great for these last hundred years, and is so likely to go farther, that it certainly is very necessary that the people of this nation should be acquainted at least with the chief arguments against that religion. Of these, therefore, you will here find some account; not a large one indeed, because none but things of the greatest moment have been selected; yet such a one as will, I hope, clearly shew that our ancestors were indispensably obliged to leave the communion of the church of Rome, and that we are as strictly bound to continue that separation as long as the terms of her communion remain what they are.” His biographer adds, that, should the controversy between, the Roman catholics and the church of England be revived, excellent materials for conducting it may be found in bishop Ellys’s performance. Besides, there can be no period in which a protestant should be a stranger to the grounds of his profession, and in which it will not be extremely proper that literary men in general, and divines in. particular, should have a good acquaintance with the subject.